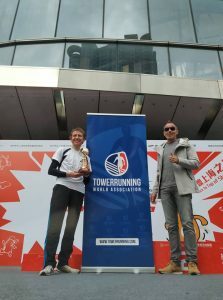 On November 25, the 2018 Towerrunning Tour Final took place at the Shanghai Tower. This was to be the first race of a three-year deal agreed between the TWA and the Shanghai Tower. 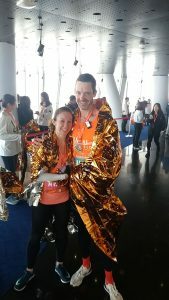 As such, the 2018 Towerrunning Tour would finish at the end of November. 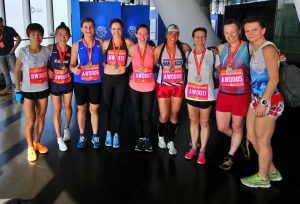 Although there were no less than six towerrunning races taking place on the same weekend, 9 of the top ten women would be competing; 9 of the top ten men would also be racing. 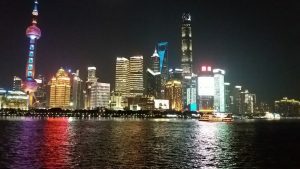 The tower itself, completed in 2015, is the second tallest in the world standing at 632m tall and towering over Shanghai’s numerous other skyscrapers. 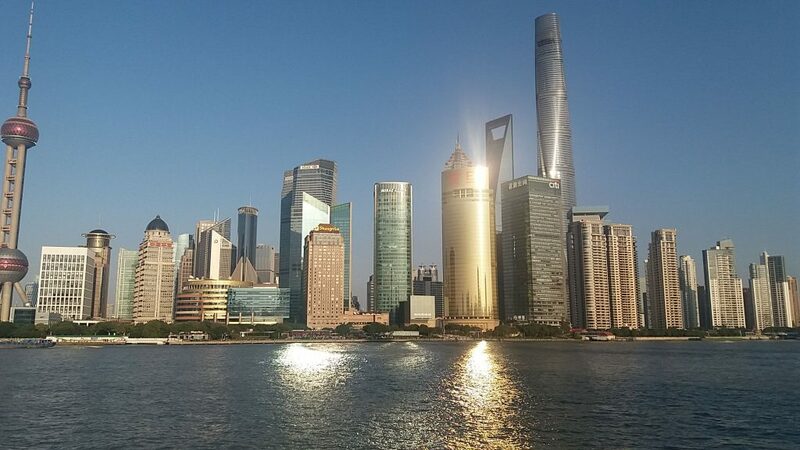 Even the 492m high Shanghai World Financial Center looks a long way down from the top of this tower! 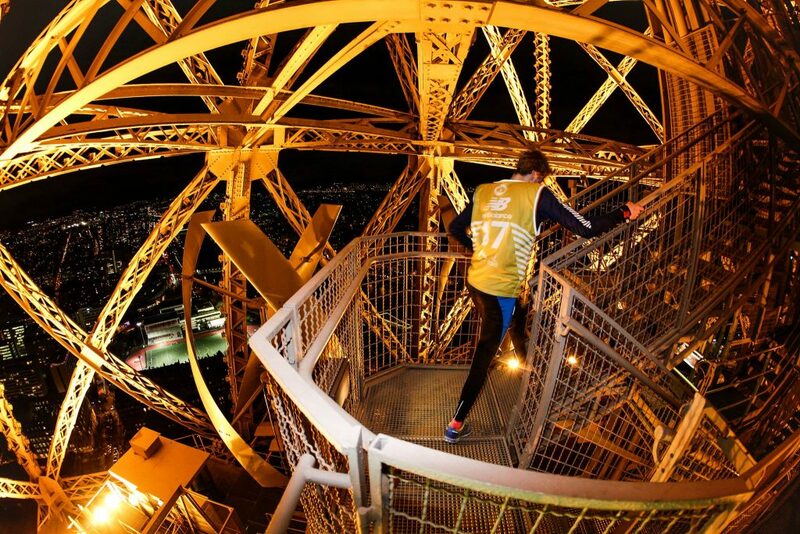 The race would see the athletes ascend more than half a vertical kilometre to 552m over 119 floors up an incredible 3,398 steps. This was undoubtedly a worthy season finale! The aforementioned changes to the Towerrunning Tour meant that year-end TWA rankings would be decided by positions in the November rankings. 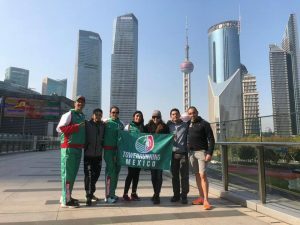 The race for 3rd place was wide open, with no less than four contenders across three continents in the running – Dominika Wisniewska-Ulfik from Poland, Mexican Maria Elisa Lopez, China’s Muhua Jian and Zuzana Krchova from the Czech Republic. On the men’s side, the destiny of this year’s crown had already been determined. 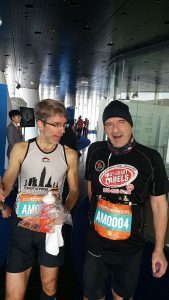 Regardless of the result in the Shanghai race, Germany’s Christian Riedl would be taking home the coveted trophy ahead of World Champion Piotr Lobodzinski from Poland. 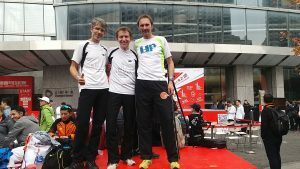 Following this year’s World Championships in early May in Taipei, Piotr’s absence from key races later in the month in Shenzhen and Benidorm where Christian was twice victorious have ultimately given the German an unassailable lead in the standings. Colombia’s Frank Carreno could still take the runners-up spot from Lobodzinski should he finish ahead and Germany’s Goerge Heimann had an outside chance of claiming 3rd place should results fall his way. Heading into race, Walsham was undeniably the ladies’ pre-race favourite. 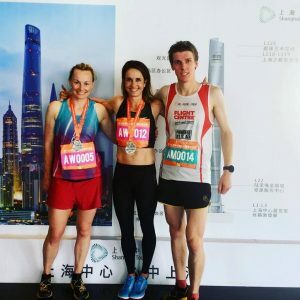 The Australian had been unbeaten this year since a rare loss in the Tour season opener in Changsha back in January to Krchova and knew that victory was needed to give her the best possible chance of retaining her Tour crown. However, with Harris only needing to repeat her 2nd place from last year’s race to top the year-end standings, the podium placings would certainly influence the final destination of the trophy. Likely contenders for a top-three placing would be Italy’s Valentina Belotti, runner-up in the World Championship, and Muhua Jian from China. On the men’s side, there was arguably no clear favourite. Lobodzinski led Riedl in the head-to-head during 2018, but with Christian having the upper hand in the more recent races between the pair. Riedl would also no doubt wish to make up for last year’s agonising loss by a mere 0.9 seconds (despite a having a cold) as well as confirming his #1 ranking by ending the season on a high. Never to be discounted, Australia’s Mark Bourne would also be a threat. Incredibly, the Aussie ran a negative split during last year’s race when finishing in third place. 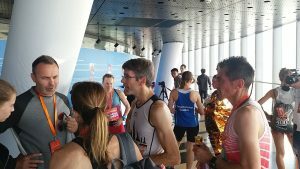 As race day dawned, the assembled athletes who had travelled from far and wide converged on the Shanghai Tower. Once again, a pre-race medical was required consisting of a blood pressure test and a body temperature check. With the formalities over, race warm-ups could begin! With the clock ticking down to the race start at 0900 hours local time, the ladies assembled in the start area. The usual time-trial format would apply with athletes released 30 seconds apart. Race order would be determined by current ranking position but in reverse, so Suzy would start last.With all the female elites having started, amongst the race favourites it was Italy’s Belotti who crossed the line first having started earlier in the elite wave. She stopped the clock in 21:44, a competitive time but exactly one minute off Walsham’s winning time from 2017. Next to top the leaderboard was local athlete Jian in 20:56. 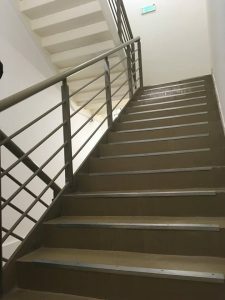 With Jian’s time remaining unbeaten with only a few runners left in the stairwell, we would soon know the identity of this year’s Towerrunning Tour winner. Back on the stairs, Walsham had overtaken Harris having started only one place behind. The question now was whether the American could still get the 2nd place finish she needed to claim the Tour crown, assuming the Australian took the win. However, should Suzy be unable to eclipse Muhua Jian’s time, Cindy would only need 3rd place, assuming Suzy would finish in 2nd place in this scenario. Minutes later, it was all over. Suzy clocked a superb 20:35 to take the win whilst also knocking 9 seconds off her own course record. Cindy could only manage 4th place, finishing in 22:42. The World Champion therefore added yet another trophy to her no doubt bursting trophy cabinet! Cindy ends the year as #2 in the year-end rankings and the impressive Muhua Jian jumps to 3rd place following her excellent 2nd place in the Tour final. Outside of the top four, local athlete Linming Chen finished just four seconds behind Cindy to take 5th place and Aussie Alice McNamara took 6th in 23:22 a fraction ahead of China’s Huiji Zhang. With the women’s race done and dusted, it was the turn of the men. Reverse order meant that Lobodzinski would be the penultimate starter with Riedl starting last. Bourne was the first runner to dip below 18 minutes in a superb time of 17:41, a massive 28 second PB on his showing from last year. This time would have won last year’s race comfortably, but would it be enough this year? Back on the stairs, Christian had overtaken Piotr! Had the German gone off too fast only to suffer in the latter stages or was he flying? As they approached the finish line, Riedl was still ahead of Lobodzinski…could he beat Bourne’s leading time though? The World #1 crossed the line stopping the clock in an incredible 17:26 taking a huge 30 seconds off Piotr’s course record. The Pole failed to break the 18-minute barrier, clocking 18:07, and would have to settle for 3rd this time around behind Mark. To put the winning time into perspective, Christian averaged a fraction under 195 steps per minute and this was most definitely not a sprint race! Beyond the podium places, Colombia’s Frank Carreno took 4th place in 18:25. The next four athletes were separated by only two seconds, with 5th going to Japan’s Roji Watanabe and 6th to the fast improving Wai Ching Soh from Malaysia. 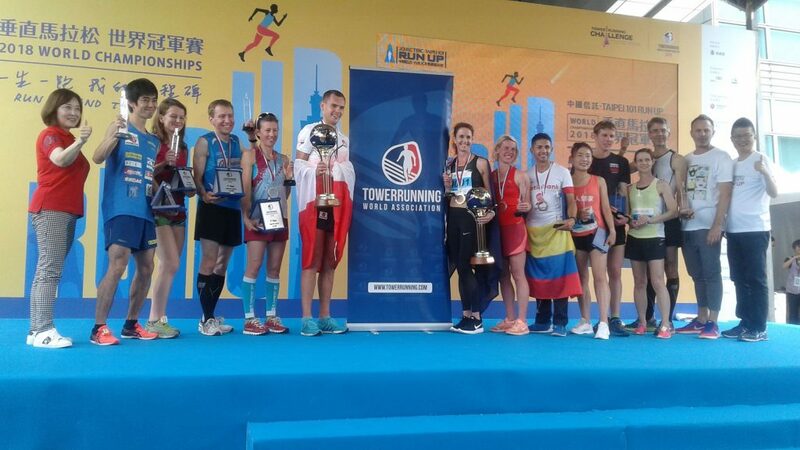 So, Christian cemented his #1 standing with race victory and would take home the Towerrunning Tour trophy to Germany. World Champion Piotr finishes the Tour season as runner-up, narrowly ahead of Colombia’s Frank Carreno. The year end rankings show that collectively, the male and female top tens can count athletes in their twenties, thirties, forties and fifties! It is also great to see some relative newcomers to the sport, such as Wai Ching Soh and Muhua Jian, climb up the rankings and perhaps start to challenge the established leaders. 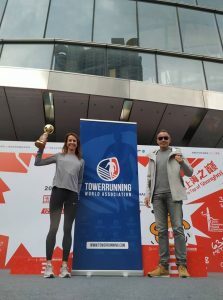 For now though, big congratulations to both Suzy Walsham and Christian Riedl for winning the 2018 Towerrunning Tour, not to mention winning the Towerrunning Tour Final and not be satisfied with just that, setting a course record too!